Silas is back. Nicole disappears. There is a sequence of Destroyer of a gang of raucous mismatched bank robbers wearing cat masks, and I thought of Kathryn Bigelow's Point Break. But forget the snappy action, the excitement and fun of Bigelow's movie. This one is pervaded by doom, and investigates the grim past of a beat-up drunken lady cop, Erin Bell (played by an extraordinarily transformed Nicole Kidman, and she is the chief reason for watching) who was once disastrously undercover. Now, Bell drags herself out of the haze of drunkenness and a cloud of anger and guilt over her rebellious teen daughter, to track down the leader of that robber gang, Silas (Toby Kebbell). "Silas is back," she says, after viewing an anonymous corpse, with an identifying sign and a pistol distinctive for having all distinguishing signs removed. As time goes on we learn piecemeal how Silas' life interwove with those of a group of others, some of whom Bell tracks down on the way to him. Kusama doesn't seem to know if she was making a B Picture or an art film, or, as Manohla Dargis puts it, hasn't figured out how to "balance form and pulp." Well, it's playing at arthouses. The writers, Phil Hay and Matt Manfredi, are pursuing something complicated and serious in the way they interweave a network of confusing flashbacks (where Kidman gets to appear fresh-faced and young) and her disastrous go-for-broke action in the present. We get segments one by one to piece together as we go along. It isn't easy, though, because a lot of the dialogue is in whispers or murmurs, so even as the pieces of the puzzle are unfolded, they can remain blurry. The final surprises are pleasing and cool, which, as Anthony Lane writes, should make us want to re-watch the whole thing to fit it all together, except as he also says, it's all so "scummy" doing so would be "the grimmest of grinds." Are there compensations? Just the fascination of doom, or the desire to figure out what the heck is going on. Equal fascination with Nicole Kidman's transformation, which she fades in and out of, even when the scene is in the present. Shot head-on as she is in the opening sequence, the heavy, maybe too heavy, makeup makes her unrecognizable. But from the side, if the light catches her skin, she starts to bloom again. And also the settings. As in some unmitigated B-Pictures (or less pretentious, non tour-de-force noir thrillers) the mixture of lavish brightness and jumbled starkness of L.A. is beautifully photographed. Kusama keeps the feel of that half-fantasy, half-real southern California crime world intense. Somebody leaves another character alone in an empty cafe, the camera pulls back, and we want to linger on it forever. Highways and bright bank fronts seem about to explode with light, as the bag of stolen dollars explodes. Somehow, though, Erin Bell isn't quite a consistent or convincing character, even if, in the present-time scenes, a stunning one; even Kidman's walk and body language are impeccably transformed, justifying awards nominations for a transformation that is subtle as well as extreme. Bell's guilt becomes wearying, and her frequent use of the word "please" seems behavior unbefitting a cop thriller. What becomes clear is that she was a local cop seventeen years ago who went undercover with a young FBI agent called Chris (Sebastian Stan), and without knowing each other from Adam, they decided seemingly impulsively to fake a love passion. There is Silas' repulsive, rich lawyer, DiFranco (Bradley Whitford) and his ex-lover Petra (Tatiana Maslany). There's the young Silas goading an exotic-looking underling, Antonio (Zach Villa) into Russian roulette - always good for a tense moment. All these scenes are violent, go-for-broke; in contrast Erin's scenes with the angry daughter Shelby (Jade Pettyjohn) seem just conventional and weepy, and Shelby's overage boyfriend Jay (Beau Knapp) and Erin's pact to get rid of him seem pushed and not very convincing. But one doesn't want to be convinced: one wants to be thrilled or amused; or, as in Point Break, all that and more. 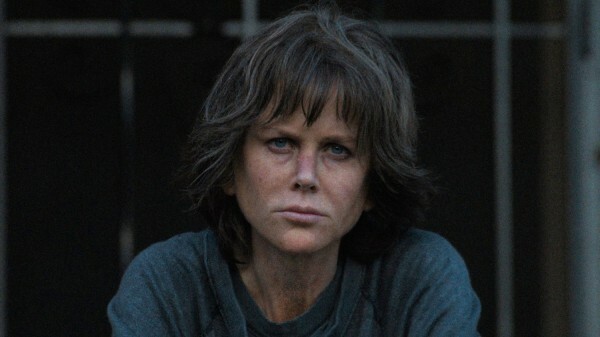 Destroyer, 121 mins., debuted at Telluride, showing in 11 other festivals including Toronto and London. It opened limited in US theaters 25 Dec. 2018. Metascore 62. Last edited by Chris Knipp; 01-27-2019 at 10:47 PM. Maybe I need to stop watching movies first and read Chris's commentaries on them before instead. Here we find a luscious commentary about Nicole Kidman's film. It's only failing, but justifiably so (who has that time and patience), is that it's too short because he raises some fascinating observations that just beg for further explanation (not that one might disagree with him). There just seems to be an impeccable eye for detail and the thoughts behind the observations just wait for a rich and educational film critique. His commentary just wets the appetite and Chris has offered up a fine appetizer and a portion of the main entre, yet we are left waiting for the rest of the delicious main course to finish up. And Chris in this commentary has left off the most desired of commentary elements, the tantalizing desert complete with an encapsulated summary and final opinion of the overall movie. We are left hanging on Chris's words and impending judgment in suspense.